It is a tint that sweet color like ice cream melts coolly. The pigment is uniformly colored with high water adhesion. So the color persists. It is a summer red color that brightens the skin. Rich in minerals and vitamins. 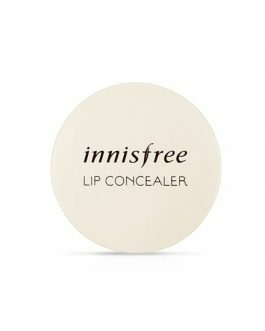 Provides a moist and refreshing fruit lips. These come out very sheer but that is what I like about them. I love the colour of OR205 Apricot Red!! The colour shown on the packaging of the lip tint comes out the same when I apply the tint on my lips. The colour shown in the photo is different from the actual product, but I still love the colour. 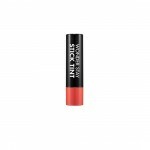 The lip tint is more of a pinky coral colour whereas the photo shows it is more orangey. You can definitely build up the pigmentation. Also, this lip tint is more moisturising than the original dear darling watergel tints. The packaging of these are absolutely adorable!! I managed to snag only one of these but want all of them! I purchased PK005 Oh Peach Red. The color is darker and not very “peachy” on me compared to the picture but I still love it. As someone else mentioned, it’s sheer on first application, BUT I like that about it as well. You can definitely apply more layers to build up the pigmentation. It has a doe-foot applicator, making application very easy and quick. I love the gel-like texture too. Please restock soon!! I purchased the shark red colour and its a really pretty ! the packaging is cute too !!! Super cute packaging and all the colours are very nice! 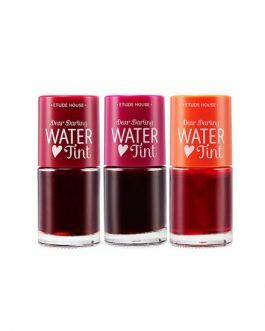 It is a bit sheer compared to other lip tints since it uses a watery formula but it is great for dry lips since it is quite moisterising! It is also easy to create a gradient lip and is very natural looking. Application is quick and easy so you can keep it looking pigmented easily all day! The color shark red is a very prigmented burgundy color. 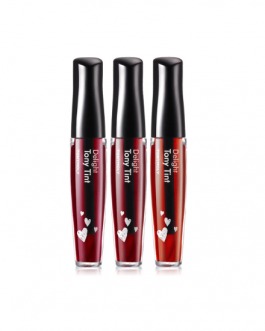 The tint has a very nice fruity smell that dissipates after application. The lasting power is very nice as well! I got #RD306 Shark Red. First of all, I love the packaging, it’s so cute and travel friendly. The color is such a nice bloody red with a hint of burgundy red, more suitable for the colder seasons. The formula is moisturizing but doesn’t last long since it’s a water type tint. Also, I have to apply several layers to get a nice coverage. Despite of that I think it’s a nice tint. I’d like to try another color. i bought shark red and it’s Exceeded my expectations! ???? 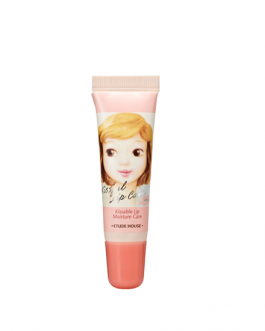 I’ve been looking for a cute watery lip tint & this is simply perfect. The shine & the gloss of it makes it look so nice on the lips. the color is just adorable. Definitely one of my favs, if not my most. The stain doesn’t hold up well after a meal, but it’s such a nice lip product that I don’t mind having to reapply. Plus the packaging is super duper cute! I really like how this tint doesn’t leave a dry feeling on your lips. The stain holds on nicely. Also the packaging is very cute and unusual! I love them! I like how they are sheer but buildable and non-drying (not matte which I love but also not like extremely shiny, but just right, quite natural shine). The stain also lingers for longer than I thought! I hope Etude is going to have them for ever! I purchased the color “Honey Red”. I must say that this lip tint stain product STAINS very well. After I applied, the stain remained on my lips for a good 6 hours. The formula is a very wet and thin one.The stain dries pretty fast after application and I find it hard to do a gradient with it. This is my 2nd time purchasing this lip tint, but I chose a different shade this time. This time I tried the Watermelon Red and I love it. More pigmented than the Apricot Red. It is a very nice watermelon red colour, just like the picture shown. The packaging is so cute! I bought PK004 Red Beard Red – I think it’s supposed to be Red Bean? Anyways, it’s the perfect MLBB dusty pink shade. It dries down quickly without drying out my lips. It also smells like candy, but try not to get it on the inside of your lips because it tastes awful. I chose the Shark Red shade. The shade is a subtle MLBB shade – very wearable for everyday. The packaging is so cute and it ‘tastes’ really yummy. The only downside is that the applicator is short so it makes applying the product quite clumsy and this is totally not long-lasting. I bought the watermelon shade and I love it so much! it smells just like Tony Moly’s Delight, really fruity and juicy, but it leaves a very uniform application (unlike Tony Moly, which pretty much sticks to every dry patch). It looks really natural and pretty. Also, it has great staying power. Totally recommend ! The packaging is what really attracted me haha. The tint itself has a subtle color payoff. The texture is slightly glossy but not sticky, almost gel-like. The color is so wonderful. A mix of red, orange and brown – perfect for autumn. The packaging is super cute. It doesn’t dry your lips and it lasts for a long time. rd307 watermelon red is such an adorable shade. On my lips is a bit more pink than in the photo, but still is an adorable watermelon shade. 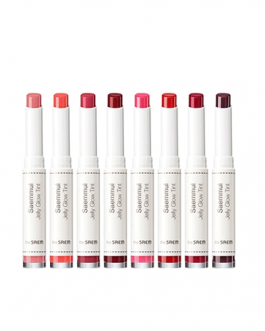 The application is really easy even for creating the gradient lips, it’s buildable and lasts for a long time (much more than I thought for such a watery formula) without drying out my lips too much. 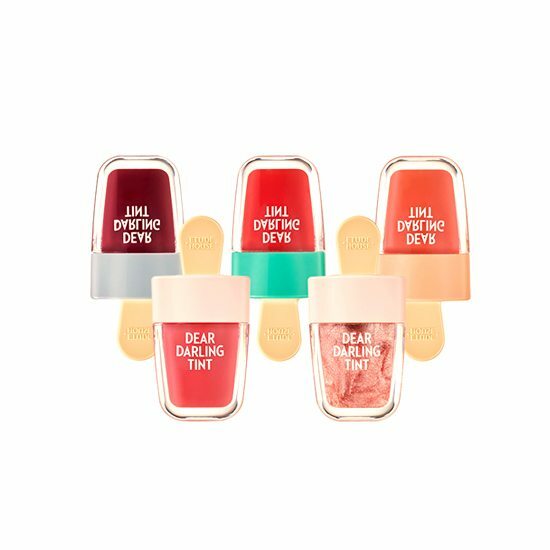 It’s a perfect everyday tint for me, I think I’ll buy shark red and red bean red too.